This post was written for my Building Social Media Relationships class at the McMaster Centre for Continuing Education, but feel free to use it if it’s helpful. 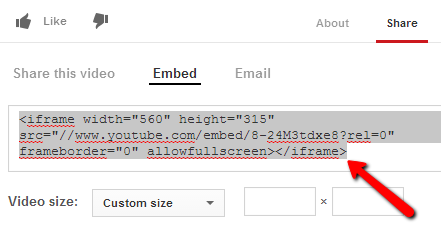 Some of you have been having trouble embedding videos in your WordPress.com blogs. 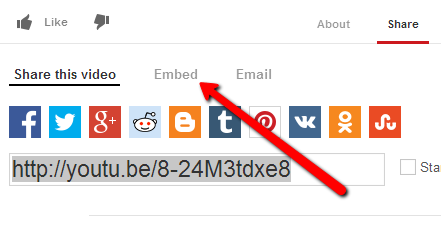 Adding the link to a YouTube video on its own line doesn’t seem to work. Here’s another way. Find the YouTube video you want to add to your post. I’m going to use this video of a kitten meeting a hedgehog. Under the video, click on the Share link. 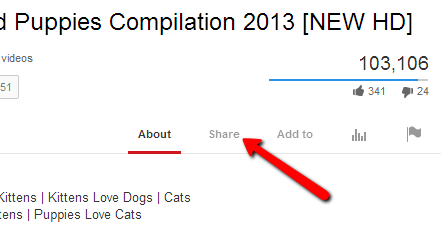 The “share” link under the video. Then, click on the Embed link, just a little further down the page. A box will appear underneath with some strange-looking code highlighted inside it. This is the embed code. Copy all of the code. Copy all of the code in the box. Now, open the blog post you’d like to put the video on. In the editor, paste the code on a new line. It might run over onto a second line. That’s ok. Don’t change the code at all. Update (or publish) your post. The video should show up where you pasted the code. When you go back to the edit screen, the code may have changed. Don’t worry about that. Just leave it as it is. Bloggers: Focus on Process or Goals? Are You Going to WordCamp Hamilton? Next story My Pebble Smart Watch: What I like so far.